Body Rolling is practiced on a six to ten inch ball. 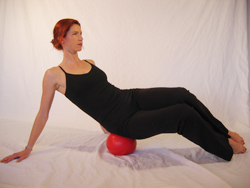 While many people use balls in an improvisational way for stretching and bodywork, Body Rolling is practiced according to specific routines, in a sequence that follows the logic of the neuromuscular system. 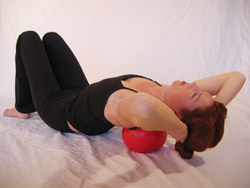 The general rule of Body Rolling is this: Muscles release from origin to insertion. Following this tenet, you place the ball at the point where a muscle begins, where its tendon touches bone. You release your body weight toward the ground via the ball, and then you wait and feel for change. 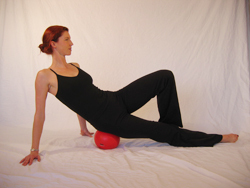 The pressure from the ball begins to stimulate the tendon, bringing increased circulation to the area. As the tendon becomes more elastic, it releases at its attachment at the bone, initiating a release through the entire muscle. 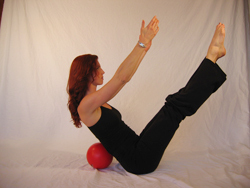 This release translates into a sensation that the body is sinking deeper into the ball, while the ball is actually moving toward the muscle insertion. Once you experience this change, you will have firsthand knowledge of exactly how a muscle lets go and what complete release really is. Then you can transfer that experience to your work with clients. Body Rolling will help you maintain the health of your own neuromuscular and skeletal systems. 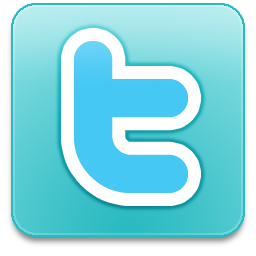 It helps you learn to listen to the useful information the body communicates to you, making it possible to develop greater control over your internal state and increase your ability to use your body more freely and intelligently, whether in your body therapy practice, for exercise or just in daily life.